This winter it seems every time I talk to someone, they have been under the weather or are taking care of someone who is sick. I know it is that time of year, but there is so much illness going around! Compared to some friends, my family has had it easy. We have had a little sickness go through our house, but mainly aches, pains and just wanting to sleep, with a couple of terrible colds. I hope you and your family are having a sick-free winter because there is some yucky stuff going around! 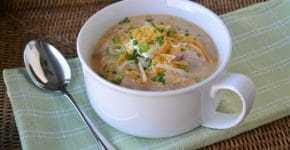 This is a great soup whether you are sick or just want some quick old-fashioned cooking! 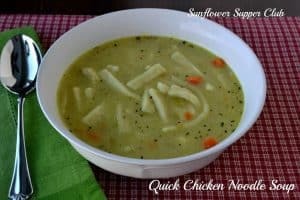 The recipe is basically a quick version of my chicken noodle soup for which I simmer chicken and make my own broth. Sometimes you don’t want to go through all that and just want to whip something together quickly. It does take a little longer than opening a can, but it is sooo much better. Here’s to a healthy rest of the winter! Over medium heat, melt butter in Dutch oven. Add the onions, celery and carrots. Cook for a few minutes until beginning to soften. Add garlic and cook 30 seconds to fragrant. Add the chicken broth and seasonings and bring to a simmer. Simmer for 15 minutes. Pour into soup and stir in the noodles. Continue simmering for 10 more minutes. Add chicken and ½ and ½, and heat for a couple more minutes. My mouth is watering just to look at that gorgeous bowl of soup. I SO love the texture of the frozen noodles. No doubt, this is a recipe that will be made often throughout the winter. Thanks for sharing. I really don’t have a good chicken noodle soup in my files, so now I do. YAY! Kim – wanted you to know I shared your recipe this week at my blog. And linked it up at Weekend Potluck. MM good! =) Hope you enjoy a delightful weekend Friend. Thanks so much Marsha! Hope you have a great weekend as well!